College is a fun yet stressful time for young adults starting a new chapter in their lives; however, with university life comes with heavy coursework and projects that take up much of student’s time during the day and night. According to a study at Brown University, only 11 percent of students reported they get a decent amount of sleep, but 73 percent of students admitted to having sleeping problems. 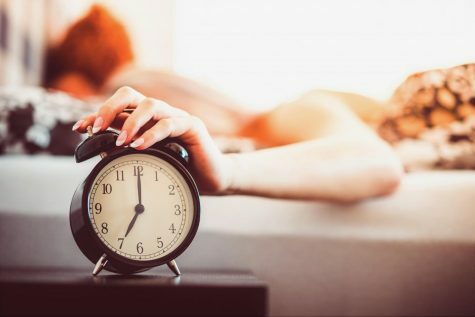 Most doctors will say that the average adult needs at least seven to nine hours of sleep every night, but this also depends on the person and how much sleep they need in order to feel rested. Students shouldn’t try to pull an all-nighter for an exam, project, or assignment as it can lead to sleep deprivation. While most college students believe that staying up all night shouldn’t be bad for them, it can actually cause several health and mental problems. Students can be bogged down with coursework that requires at three to six hours-worth of work on just that particular subject. Understandably, college students are required to go to class, take notes for the lecture, do their assignments, and prepare for the next class meeting. Professors have every right to expect their students to do the work for their class, but don’t necessarily take into account that a typical college student will have 15 hours, which means they have at least five classes in total to worry about. The workload of one class might be lesser than another course, but for a student to spend three to six hours on every class in order to do assignments and preparation for the next meeting can take away time spent sleeping, eating, or having fun. A solution for working through the piles of homework is a time management plan. Allotting the right amount of time it takes for a student to work through college algebra problems or how long it normally takes them to read through a chapter can help. The student knows better than anyone how long they work on a problem or read a chapter for class. They can also use the time management plan to plot out when they know they’ll be free for lunch and dinner, if they are going to work out, or if they are going to hangout with friends at a party. Not being able to either acquire enough sleep or any at all can lead to a deterioration of mental and physical health, academics, and athletic ability. When the body is asleep, it takes this time to repair damaged cells and help fight off infections or viruses. If a student becomes sleep deprived, they run the risk of becoming sick due to the immune system becoming weak, and the lack of sleep can affect the heart and lungs, which leads to chronic lung and heart disease. Sleep deprivation has also been associated with depression, stress, and anxiety, which inadvertently can affect students’ academics, athletic programs, and relationships with family and friends. College students are especially susceptible to depression and anxiety as the responsibility and pressures of classes can weigh a person down; especially, if they are not receiving enough sleep at night to rest the mind properly. Students don’t need to stay up all night to finish a project, an assignment, or study for the final exam the next day. Studying the same amount for any other test can produce the same results as long as you plan accordingly and don’t wait until the last minute. Having a time management planner can help with scheduling time for all of these things, but with the possibility of stress, depression, and anxiety, students might want to look for options at their university for help. A counselor can help them with ways to remain calm and feel less stress out about the work load, or even speaking with a friend or relative can help release some stress and anxiety. The best possible way college students can try to fix their sleeping habits is to maintain a regular bed and wake time schedule, including the weekends. Sometimes oversleeping for one to three hours on the weekend can wreak havoc on your sleeping schedule. The University Health Center at the University of Georgia suggests that “establishing a regular, relaxing bedtime routine such as soaking in a hot bath and then reading a book or listening to soothing music” can also help the body wind down from a long, stressful day. It’s also important not to eat a huge meal at least two or three hours before bedtime and avoiding caffeine, nicotine, or alcohol can also prevent the body from getting a restful sleep. As college students, it’s important for them to take responsibility for handling the amount of work each class has to offer and developing a plan to handle it so they are not overwhelmed. However, professors should keep in mind that students have other responsibilities outside of their class and other courses as most students will be a part of some extracurricular activity.